Sunday lunchtime will see Motherwell and Rangers meet for the final fixture before the Premiership split. The teams shared six goals in August when the teams last met at Fir Park. Will this be another goal fest? Midweek matches delivered different outcomes with Motherwell losing in Aberdeen while Rangers saw off Hearts at Ibrox. Suspensions and injuries will cause both teams to make changes. The fallout from last weekend's match at Parkhead will remove Morelos and Kent from the visitors' squad. The pair are important contributors to Steven Gerrard's team but he has plenty of replacements available. The depth of squad available at Ibrox means that few tears will be shed for any alleged selection problem. 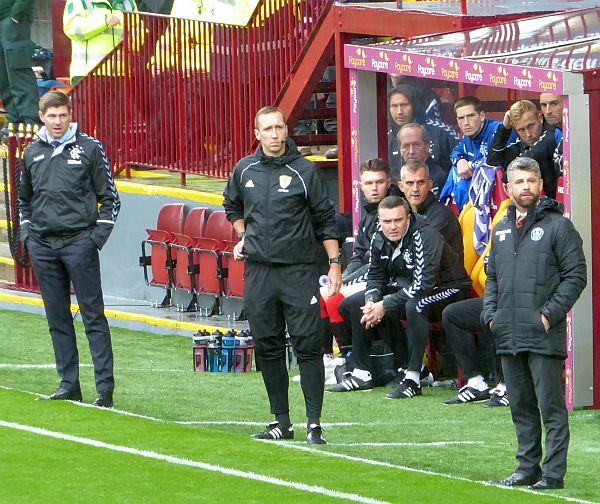 The Rangers manager will have to watch proceedings from the stand as his indiscretions cost him a one match ban. On paper this might appear to be a mismatch: second v eighth, 63 points v 43 points. But appearances can be deceptive. The last two meetings at Fir Park failed to produce a winner. Motherwell fans have an anxious wait to discover the nature of the injury that resulted in Mark Gillespie leaving Wednesday's match at Pittodrie on a stretcher. When Trevor Carson was forced to stop playing in mid-November Gillespie stepped up and proved to be an excellent replacement. Rohan Ferguson was called from the bench to make his first team debut and was unfortunate to face two unstoppable shots as the game was lost. The challenge for Motherwell is now to return to seventh place and claim financial reward that come as best of the rest. The manager will expect wholehearted commitment in the remaining six games but he must also be planning for next season. With little to play for but pride there's no reason why we can't capitalise on home advantage and cause a wee shock with a 2-1 home win. Remember the last visit from Rangers?